nevard_120529_Bristol-LS_DSC_5233, a photo by nevardmedia on Flickr. At RAILEX over the weekend an hour or so before the show ended I finally got around to having my tour of inspection and came across this rather nice diecast EFE Bristol L.S in Southern National green livery on the hosting club's secondhand stall. The clincher being the Devenish Draught advert which sadly now promotes that long gone well loved Weymouth brewery. All starry eyed, I donned that dirty gabardine raincoat, greasy hair with comb-over, NHS specs, National Express holdall from 1970, an old bus timetable entwined in with my snotty hanky and broke into the £4 pocket money that mother had some kindly given to me along with corned beef and salad cream sandwiches - job done, and here it is posed on the nearest I have to a street scene on my various trainsets. In the latter half of the 1970's I lived in Dorset and recall the school bus was occasionally one of these, it was very clapped out and would often stall going up a 1 in 6 hill which was part of its windy route through the hills. The stalling would usually happen during an uphill gear change, and on one occasional we all had to disembark to make the coach lighter in an attempt to help the driving get it going into second gear. With the bus finally going at walking pace we all then got back on. Of course in today's world such would almost certainly involve death of nearly all involved, sacking of the driver and a very expensive televised inquest. The two surviving school children would then go in Britain's Got Talent or the X-factor and win with a sympathy vote. The school bus route would then be disbanded because it would be deemed far to dangerous and road deaths in the area would rocket due to 4 x 4 accidents from drivers on the school run. 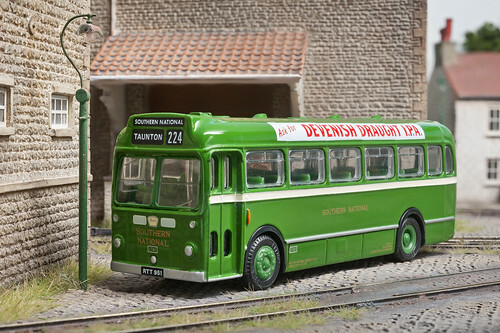 It's a very pretty bus though I'm sure you'll agree, and perfect for my Somerset based layouts. In due course it might become a superdetail/Workbench project, but not today because again the weather is far too nice, so a day in the garden beckons. RAILEX 2012 – and what a show it was! 120527_railex12_DSC_5164, a photo by nevardmedia on Flickr. 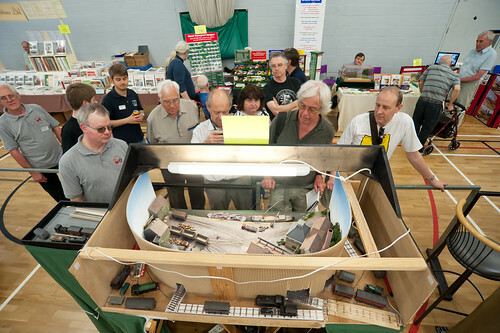 The annual Railex in Aylesbury on the weekend of 26th and 27th of May cued the beginning of summer like it so often does. I’m sat here in the garden with laptop taking advantage of the weather, our rather limp-wristed wi-fi just about giving me a signal strong enough to allow me to reflect on a fabulous weekend away from the more usual camera, sofa or modelling bench. Railex as always is in a very well lit supersized tin shed built for some Olympic thing a couple of decades ago, and excluding my poor effort hosted some of the best talent around in the toy chuffer world without disappointment. The Princes Risborough club have this knack of packing out the floor space with all sorts of gems from both modellers displaying what if added up must be hundreds of years of workmanship along with those sought after retailers (those all important men in sheds mostly) selling wonderful goodies no longer found in high street model shops – even if you have one that is! As an exhibitor, this was to be my 5th Railex, for some reason they wanted me to bring Brewhouse Quay http://nevardmedia.blogspot.co.uk/search/label/Brewhouse%20Quay along, I’m not sure why, but I’m guessing it’s a good example of a quick ready to plop bodge in model making and how not to do it which isn’t really what the show is all about – it’s a show for better than that. For 4 years out of 5 I have been in the corner furthest from the door, which frequently is a quadrant of 1/76 scale layouts which this year consisted of the forever growing Bron Hebrog (OO) http://bronhebog.blogspot.co.uk/ , Albion Yard (OO) http://albionyard.wordpress.com/ , Canada Road (EM) http://www.emgauge70s.co.uk/layout_canada.html , Diesels in the Duchy http://www.rmweb.co.uk/community/index.php?/topic/12234-diesels-in-the-duchy-aka-st-blazey-dcc-em/ - all great company I’m sure you’ll agree! Of course there were many other equally fantastic layouts which can be found listed here http://www.railex.org.uk/railex2012l.html with reviews popping up on the various toy chuffer forums. Best Layout deservedly went to the lovely pre-grouping Penlan http://www.rmweb.co.uk/community/index.php?/topic/1432-penlan-lnwr-in-south-wales-1910-em-gauge/ - a very worthy winner all the way from Cornwall depicting a lush part of the LNWR in Wales a little north of Swansea. Within 30 minutes of the doors opening curiously beer started to arrive, totally out of the blue some lovely Loose Canon Brewery http://www.lcbeers.co.uk/ draft ale from 7mm scale modeller and altogether top chap John Atkinson was passed over the fiddle yard. Before the smiles had faded Samuel Bennett – another altogether top chap and eager snapper I hasten to add, handed over 2 bottles of ale, one from Ascot Ales and another from the Windsor and Eton Brewery. Because I know that you chaps read my twaddle here, you be delighted to know that the *beer has now all gone* (jobsworths, please read the disclaimer at the bottom of this page) – the hot weather making it even more tasty – so CHEERS to you! 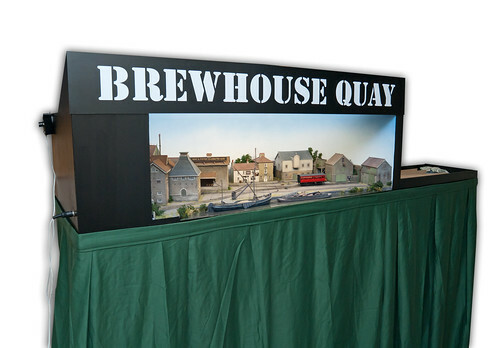 The hoppy malty aroma of the ales helped the atmosphere of the brewery themed layout all too well. I might have to install handpumps next time the layout goes out! Despite felling a little squiffy from all the ale (more likely the heat), Brewhouse Quay worked well, with only one point switch-blade parting company from the copper clad tiebar – easily fixed with a dab of the soldering iron luckily. The Caboose Hobbies manual ground throws caused interest or irritation depending on whether you’re a ‘hand of god’ type of person or not. 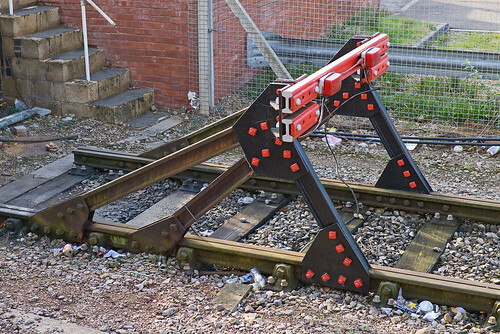 BQ uses 3 link coupling because they look good in photos mainly, so ‘hand of god’ to operate the points is only a little more intrusion. Thanks must go to the Railex team who as always do their best to make the show go well behind the scenes as well as ‘front of house’ ensuring a good experience for all. Finally my BIGGEST thank you must go to Graham Muspratt who gave up his whole weekend when he could have been enjoying BBQs and such, but instead helped operate Brewhouse Quay in a far more professional manner than I ever can. I’ve been asked about next year’s Railex but I do have a few overdue layout-operational debts to pay to other layout owners, I am also planning a modern themed 12 footer with DCC sound and actual mineral loading, but that’s another story…. * Note for jobworths: The beer was drunk at home later, being drunk in charge of a model railway in a public place would be very irresponsible of course, driving over a layout spider would not be good.We did sample two bottles in our respective meal breaks for research purposes, and placed the empty bottle on the side of the layout to help with the atmosphere. nevard_120520_BQ_IMG_3332, a photo by nevardmedia on Flickr. Sunday morning at Brewhouse Quay, 'Radstock' and its crew are having a tea break. The old Austin van is a recent second hand purchase by the brewery to use for carting casks around the complex. 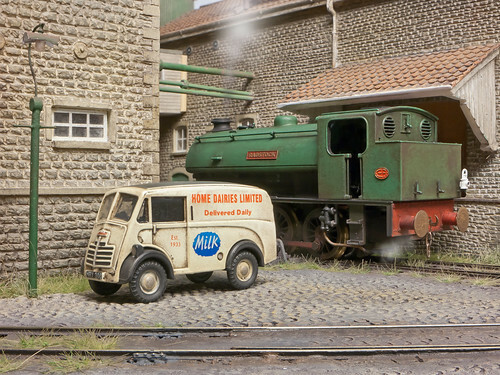 The plan is to repaint it in brewery colours, but this has yet to happen and is still displaying 'Home Dairies Limited' and in a rather sorry state . The locomotive is also second hand, it being bought from a colliery near Radstock, hence its name. Pocketbond "Classix" EM76605 Austin 101 J van in "Home Dairies Limited" which has been weathered. For more small cars, see my collection here. J94 'Austerity' named 'Radstock', a detailed, repainted and weathered Hornby release. You can read more about it here. The street light was built from scratch and can be read about here. The cobbles are very much a feature of Brewhouse Quay and can be enjoyed and read about here. The scene here is Brewhouse Quay. nevard_120517_BQ_DSC_3618, a photo by nevardmedia on Flickr. Next weekend it's the excellent RAILEX (that's the flyer on the right by the way), an exhibition frequently being regarded as one of the best all weekend enthusiast targeted shows in the south. For some reason they wanted to invite my OO gauge Brewhouse Quay I'm guessing the reasoning being the to 'how NOT to do it' angle, so the last few days (OK about one hour) has been spent cleaning track, checking mechanics and polishing loco wheels. Followers of this blog will probably have mostly only seen pretty low angle photos that make the layout look like it is Gauge 1 occupying an area of 40ft x 20ft, this photo will hopefully spoil the illusion in advance for any moany-hard-done-by Daily Mail reading show-goers who until now were expecting something the size of an aircraft hanger. It isn't. But they might be interested in that recently I added a small cassette yard to the right hand side, this allowing trains to exit off set to the right, and when combined with the small fiddle yard behind the left hand side (via a sector plate) allowing short trains to run right through the layout from one side to the other if shunting gets a little boring. The working wagon turntable combined with chain shunting adds another dimension which proves popular with the younger audience - maybe I just need to add Thomas for complete approval? 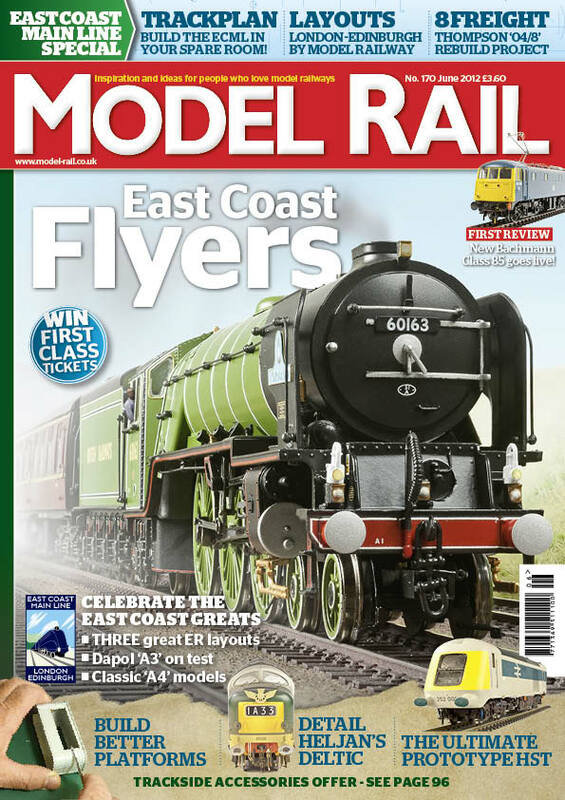 EAST COAST MAIN LINE SPECIAL! PLUS: Railfest 2012 Preview, the latest news on Model Rail limited edition models and much more! In the shops from 17 May 2012, subs copies arriving from now. nevard_110921_leamington_DSC_3796_WEB, a photo by nevardmedia on Flickr. The real world is full of things that don't quite conform to preconception, with us model makers often being the worst offenders, for this reason it’s so important to look at the real world. Luckily railways have always been well explored by camera lenses, so often research is only a key board away, or failing that the book shelf, the local library or heaven forbid the real thing. 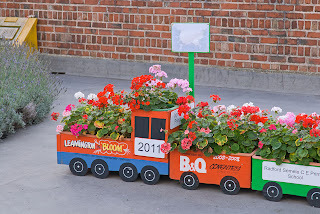 This bedazzled buffer stop Leamington Spa Station is something you’d never expect, and if you modelled it like in this photo here people would be queuing up to ask you when you’re going to finish it. I imagine with this one here this is as far as finishing will ever get, the ravages of time will take care of that aspect in due course. 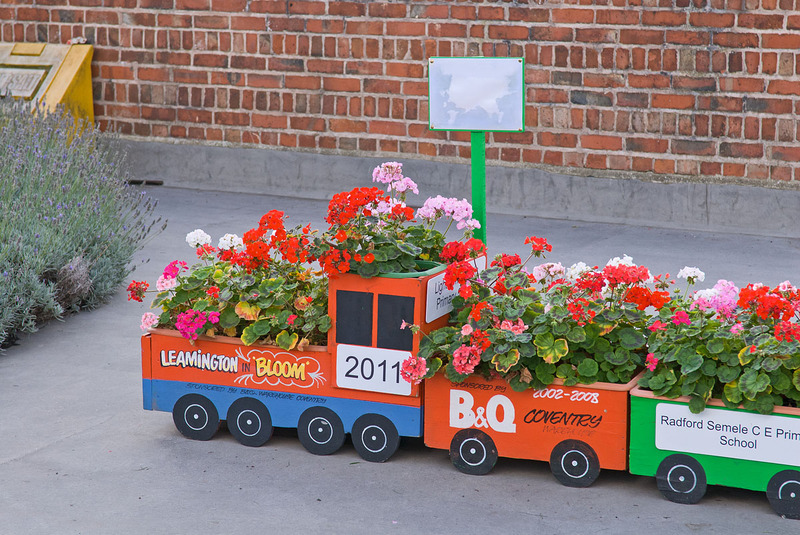 Leamington is a nice station to spend an hour of two, with great little touches like the flowering train here. There is a good variety of trains to photograph and the station staff don’t treat railway nutters with suspicion – how refreshing! 120503_4-track_DSC_4363, a photo by nevardmedia on Flickr. As an alternative to a long wait for the Aust Car Ferry or a long drive via Gloucester, the 4.40pm Severn Tunnel Junction to Pilning car train is captured speeding up the 1/100 grade towards its destination on a dull summer day in 1958. The opening of the Severn Bridge saw the end of this service aimed at the more affluent car owner which had been running since 1924. The new bridge also saw the end to the quirky Aust Car Ferry, however those that wish a trip down memory lane can visit the derelict terminal, but beware it is on private property. For the train, well you'll just have to gloat at the toy chuffer here sadly. 120502_arnewharf_DSC_4315, a photo by nevardmedia on Flickr. 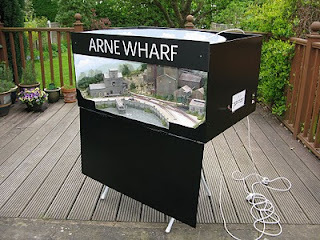 To those not familiar with some of my layouts, over the next few postings I'm going to have a look at some of the layouts I've built, starting off with Arne Wharf. Back in 2003 I'd only been back in the hobby for a year or so, and wanted to build something small and compact which could be taken to shows. Since the mid 1980's when previously in the hobby, scenic products and techniques had moved on in leaps an bounds, so Arne Wharf would also be a chance to try out some new products and techniques as well as having a bit of fun chopping up a Walthers Glacier Gravel Co kit. When at a show it's 4ft off the ground unlike here! 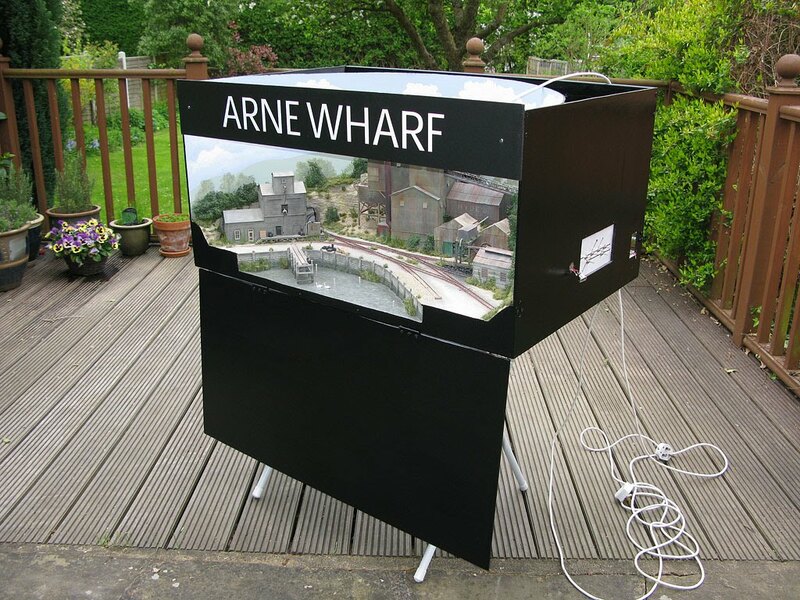 Arne Wharf is modelled in 009 (representing 2'3" gauge) and totally contained within 3' x 2'. My interpretation is based on a fictitious line running from Arne to Wareham via Ridge & Stoborough on the Purbeck Peninsular. The line was built to transport ball clay, lime stone, salt and oysters in addition to general merchandise. One of the delights of this scale/gauge combination is that almost anything goes - making for enjoyable escapism free from the hobby's more serious element. The whole layout fits in a scenic footprint of 3ft x 2ft with and extra foot for a fiddle yard. 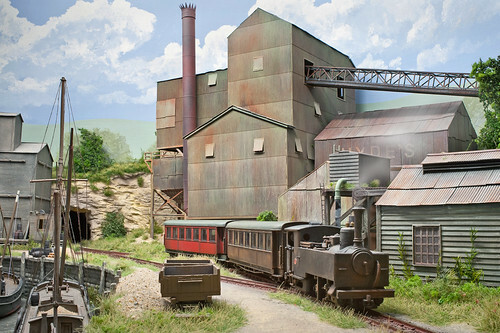 I'm hoping to take this little layout along with Polbrock to Model Rail Live at Barrow Hill on the weekend of 22 & 23 September 2012.